Featherstone Make a Difference Forum > Forum > Featherstone History > Town History > The roads of Featherstone. It is sometimes interesting to discover which roads in the town are the oldest and there origins. The oldest road in Featherstone is Green lane and Half penny lane, both part of the same Roman road and date back the the 2nd century AD (1800 years old). The original name for this road was High street. The second oldest road believe it or not runs under the park and was a local road from Ackworth moor top to High street. This also is 1800 years old and runs over the river Went at a Roman location called 'little went bridge' near to the dog on the wall. The next in date is park side which is regarded as being medieval in origin but could go back to Saxon. The old coach road is also regarded as being medieval but there are strong possibilities that it was built on top of an earlier Roman road but no evidence has been provided yet to back this up. Little lane is also a medieval road aswell has Houndhill lane and documentation exists which suggest so although again Houndhill may have had Roman origins. Many people believe the Old coach road ended at the park which is a popular misconception. It uctually continued through the park, through Girnhill lane allotments, along Hardwick road under the Lions stadium pitch, through the garden centre into Snydale villas where it may have met the Roman road High street in Streethouse. A lot of the roads today are from either modern farming or the mining industry so are fairly modern. North Featherstone however does have some old tracks that have both Roman and medieval possiblities especially the one which runs down past the Gleneagles estate to the farm. Re: The roads of Featherstone. heather do you haveany infomationon the road that run down by the side of featherstone hotel ,it went by the side of the brickyard stright down to what we called fourlane end by hodgensfarm and down past the cross keys pub . That road is called High street and was the original Roman road, it went up Green lane and down halfpenny lane a easterly direction then in the direction you mentioned in the westerly direction, eventually it went through Wakefield and into the Dales towards Skipton and was a trade route for bringing lead, copper etc to the castleford area. That road of which you speak is part of the old coach road which originally went from East Hardwick to Streethouse. Eric Houlder of the West Yorkshire Archeological society explained this to me a few years ago. The road is thought to be of medieval origin but there are possibilities which are yet unproven that it was originally Roman. The road starts it's life in East Hardwick, follows the Sandygate lane road, then onto the old coach road, across Purston park, through the Katrina estate, through Girnhill lane allotments, down Hardwick road, through Priory estate, through the Lions pitches, through the garden centre and onto Winney lane Streethouse which is the original route, then it met High street at the railway crossing. Imagine if you were coming from Roman Doncaster along Erming street with the thought of getting onto High street which is a trade route to western Britain, normally you would have to go to the Crematorium area where the two roads crossed, then turned left onto High street. This road is a short cut where you get to East Hardwick while travelling along Erming street heading to Pontefract then turn left and make a B line for High street which would cut approx 4 miles from the journey and the need to go to the crossroads at all. Between Doncaster and Roman Castleford there were located many Roman camps and forts, one was at Adwick Le Street, another at Campsall, one at Wentbridge and finally at Tanshelf Pontefract where an hoard of around 400 Roman coins were found many years ago. Also it is a possibility that the municipal golf course in Pontefract park was also a location when artifacts and evidence of an encampment was found when building the water tower on park hill. These were at some stage the Roman frontier as they progressed Northward and were continually attacked by local Celtic tribes of the Corieltuavi (us). So in essence we have a proud history of resistance to invaders such as the Romans and when they left around 400 AD your ancesters, the Celts knocked down all the buildings they had put up and went back to living a simple life. Why? Because we wanted the freedom to make our own choices and not be dictated to. Your ancesters lived very close by in Purston, Ackton and Nostel Priory and we should all be proud of the fact that we once belonged to the Corieltauvi tribes of this land. 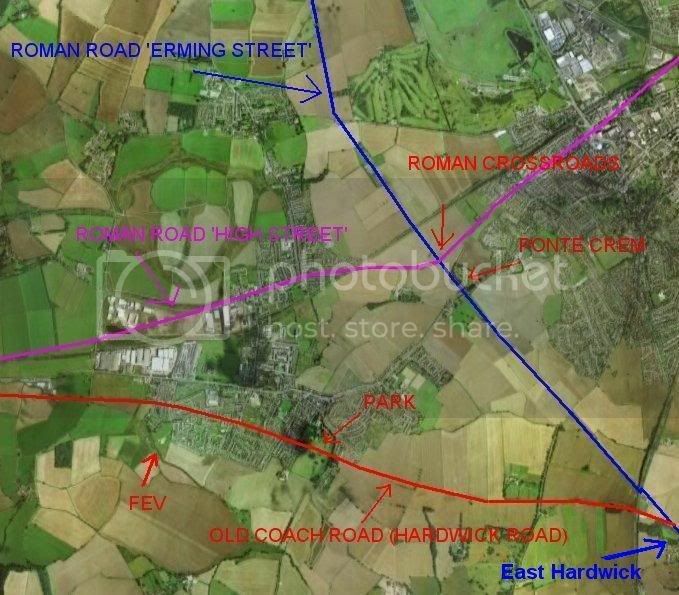 This will make it clearer and show how Hardwick road (or Old Coach road) cuts the corner off and also shows the routes of Roman roads in this area. The name Hardwick road in Featherstone is a direct indication of it's relation to East Hardwick.